According to estimates by the China Chamber of Commerce, the retail sales of sports drinks in China alone will exceed RMB 40 billion in 2017. The global functional beverage market shows a rapid growth trend with an average annual growth rate of more than 10%. 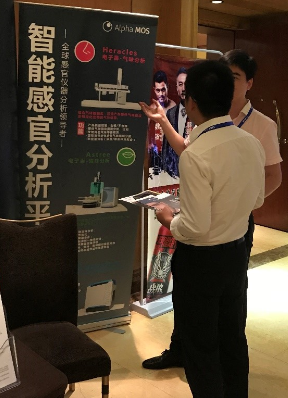 As an expert in sensory metrology solutions, Alpha MOS participated in the Asia Functional Drink Innovation Summit in Shanghai on September 20-21 to familiarize with the key players of global functional beverage market. During the summit, many delegates and exhibitors show great interest on our instruments. Our experienced technicians introduce the wide range applications of instruments and how our instruments work to meet their needs. You are interested in discovering new sensory solutions for your QC and Research & Development? Contact us NOW!